Maybe there's a trick I never learned. Care to share? I have heard great things about marshmallow bits (they come in a plastic container and are small, dried out marshmallows) but I can never find them anywhere so I haven't tried them myself. Anyway, I think I found a method that works - works better than my previous attempt anyway! First, I finally found the perfect cookie base that has the perfect graham cracker punch. 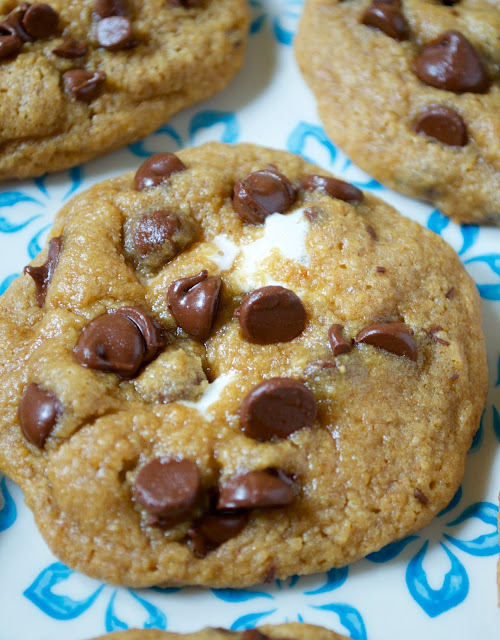 Karly, over at Buns in My Oven, posted her version of S'mores cookies awhile back and I've had it bookmarked for ages. I decided to give them a shot this summer for Cody's co-workers to test run for me. Of course, I tweaked it a bit to work for me - I had to double it if I wanted to feed the whole office and since I didn't have marshmallow bits to mix in, I had to change up some of the steps and baking times. Instead of mixing mini marshmallows right in, I flattened each ball of dough and pressed three mini mallows into the centers. Then, I rolled them up good to seal each cookie and baked them. 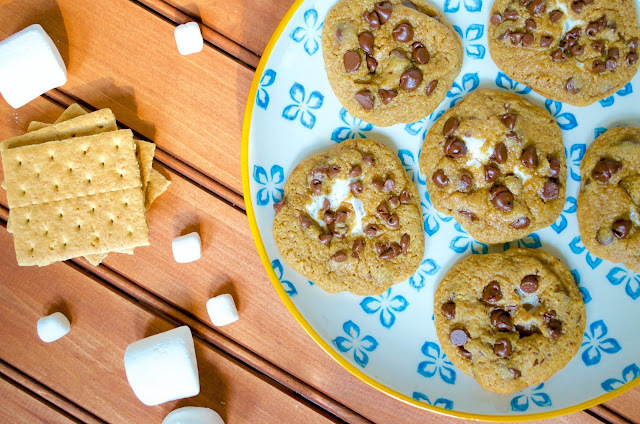 The results weren't perfect - some of the cookies definitely have an ugly vibe going - but most came out with just little melty pockets of marshmallows peeking through. Looks like stuffing the dough with marshmallows works! 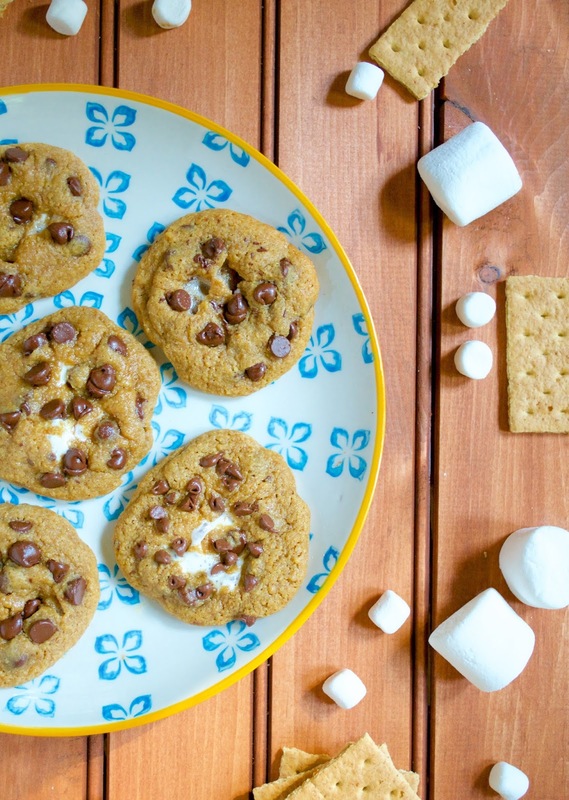 Have you baked with marshmallows before? What were your results? Have any tips or tricks? I'd love to hear them! In a medium bowl, combine graham cracker crumbs, flour, baking soda, and salt. Set aside. In stand mixer, cream the butter with the sugar (you can also use a hand mixer). Add in vanilla and two eggs and mix until well combined. Gradually add the dry ingredients to your wet ingredients until just combined. Chill dough for 20-30 minutes. Using a medium cookie scoop, roll a ball of dough and then flatten in your palm. Place 2-3 marshmallows into center and roll dough around, enclosing the marshmallows entirely. Place cookies onto parchment lined baking sheet. Bake for 9-10 minutes. Let cool on baking sheet for a few minutes before transferring them to cooling racks. As I was reading through this post I started thinking "What if you roll the dough into a ball with a marshmallow centre" Hahaha! Great minds think alike. I've never used marshmallows in my baking, but I will definitely give it a try soon! 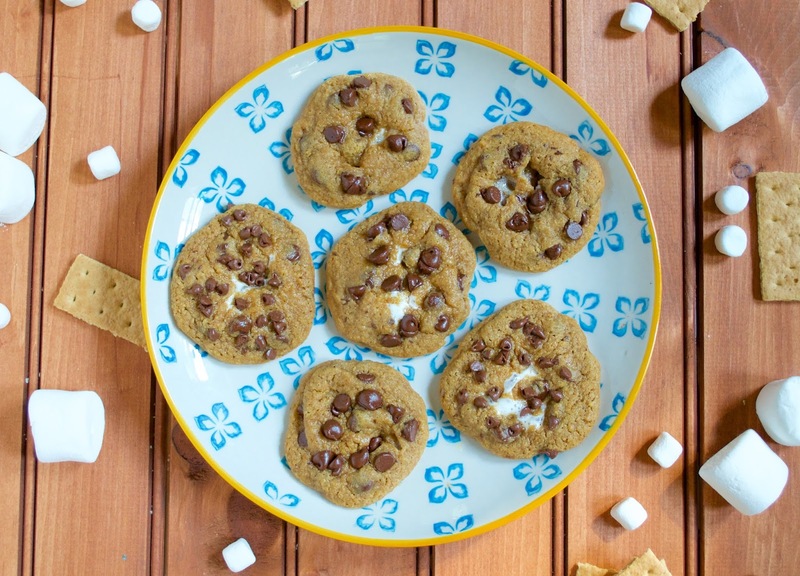 These cookies look amazing though - well done! Count me in! I love the sound of these cookies. If they are challenging, they must be great! 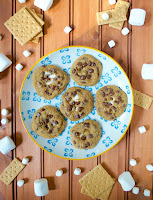 I love cookies, and the sole fact that these pictures are amazing, I am already drooling and I want some, please! I feel your pain, I have tried cookies with marshmallows in them and they were a disaster. 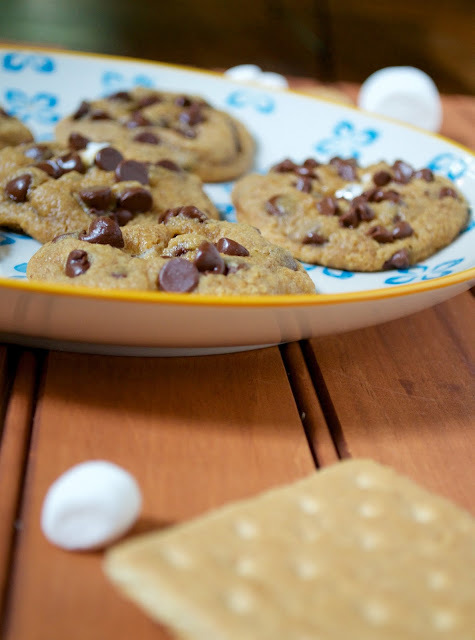 But at least you have defeated your demon and made these lovely looking cookies. 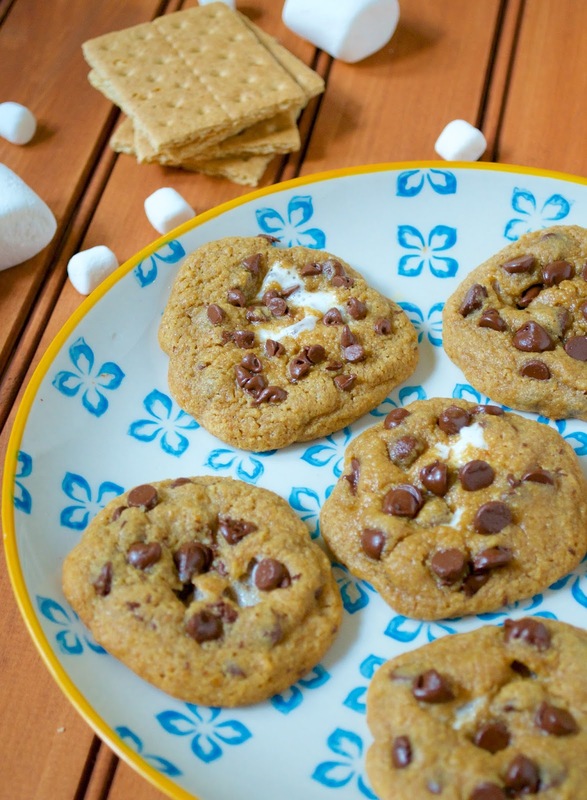 I love, love s'mores desserts. 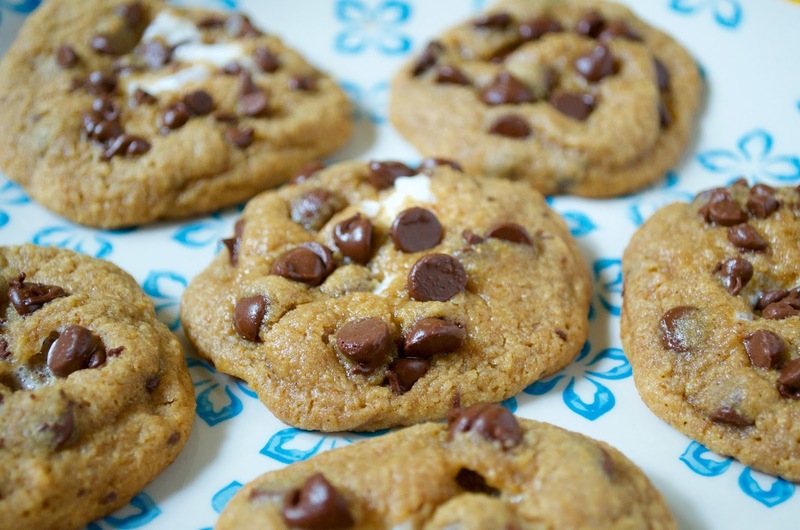 In fact, I love them a lot more than s'mores them selves :) What I do is press the marshmallows into the hot cookies as soon as I pull them out of the oven. They won't totally melt and the cookies are still pliable enough to give and attach to the marshmallows.